Today's post is featuring this gorgeous (gorgeous is an understatement, if you ask me) lace top! The detailing of this piece is so elegant and unique. From the gathered pleats in the front to the dainty buttons in the back, it is one that will bring compliments your way all day long (I got stopped by three people wearing this out to dinner). 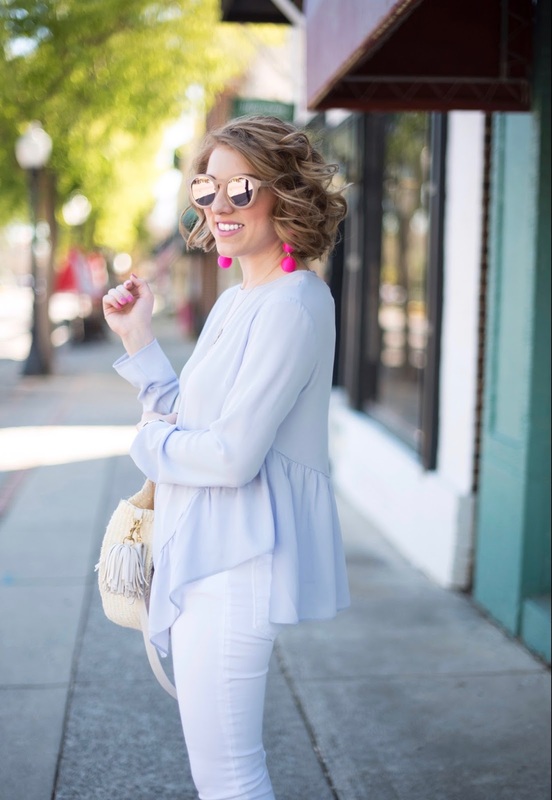 I absolutely love it paired with white denim as a grey, white and blush combination is always a winner in my book :) Would you believe that it's under $50? There are so many pretty pieces on Chicwish right now for an unbelievable price. Ordering from Chicwish can be a bit tricky at times as some of the pieces tend to run a little large. I'm usually a 0, 2 or XS across the board, but I'm wearing a S/M in this piece. Some of the pieces on Chicwish do come in XS, S, M, L, etc. so those pieces would be more of a true to size fit. I will link my favorites from the new arrivals below! Well, my baby turns two tomorrow and I'm feeling all the emotions :( I keep asking myself where on earth has the time gone?! I can't help but re-live all of the events from this time two years ago. The day I became Madeline's Mama is without a doubt the best day of my life. I'll be sharing something special on here for her birthday tomorrow, so be sure to stop back by! I hope y'all are having a great week! I'm swamped with school assignments to finish up before spring break next week and lots of crafting to finish up for Madeline's birthday party this weekend. So much to do, so little time! What have y'all been up to this week? Happy Monday! 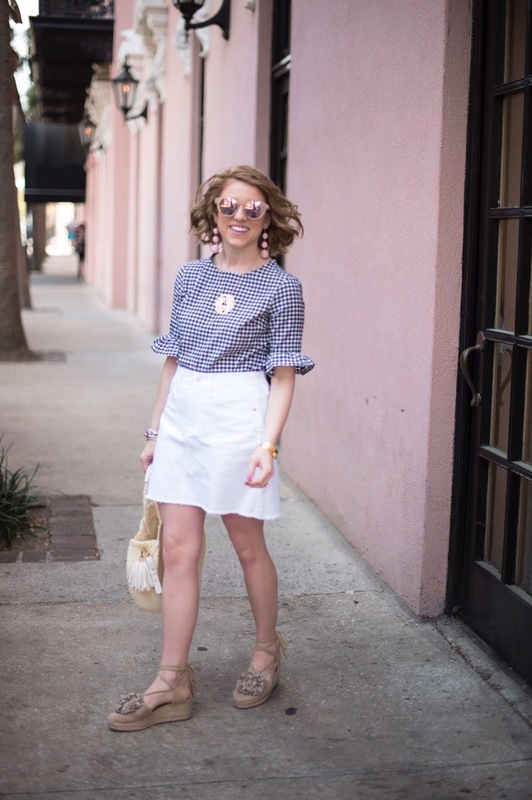 Here's one of my last outfits that I will be featuring from my Charleston trip a few weeks ago. 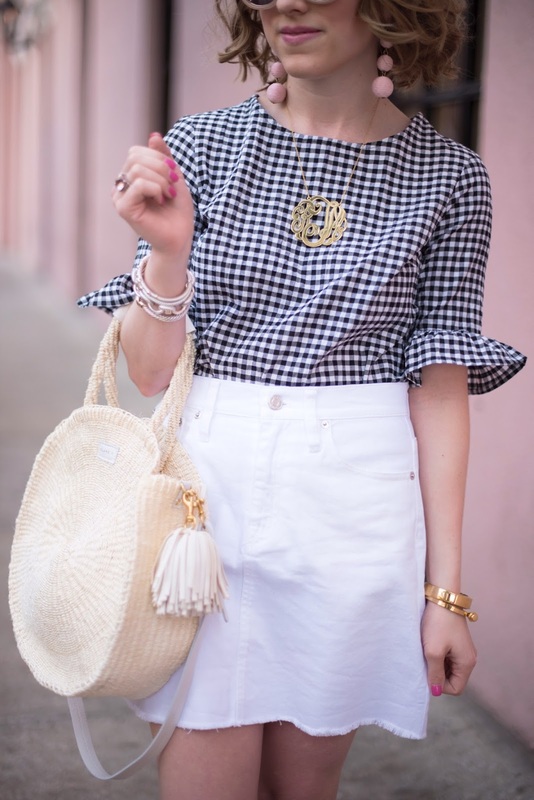 One of my favorite trends for this season is without a doubt gingham! 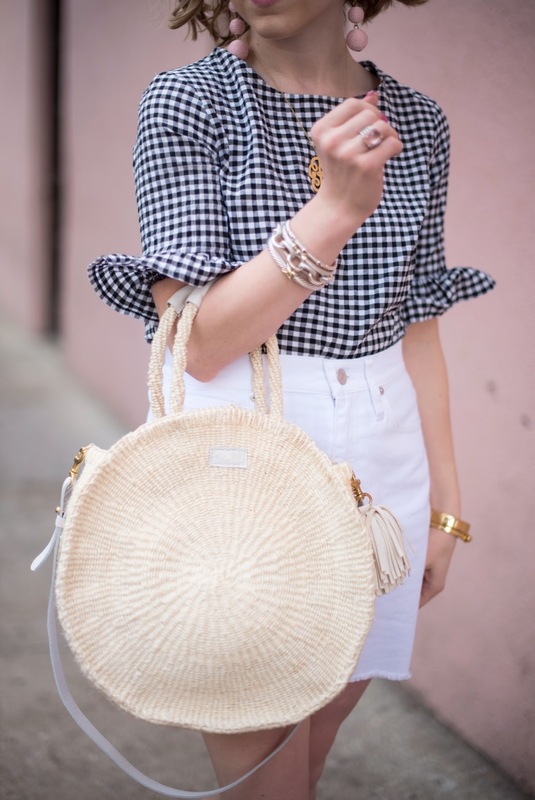 I absolutely love it and feel it is such a fun spring/summer essential. 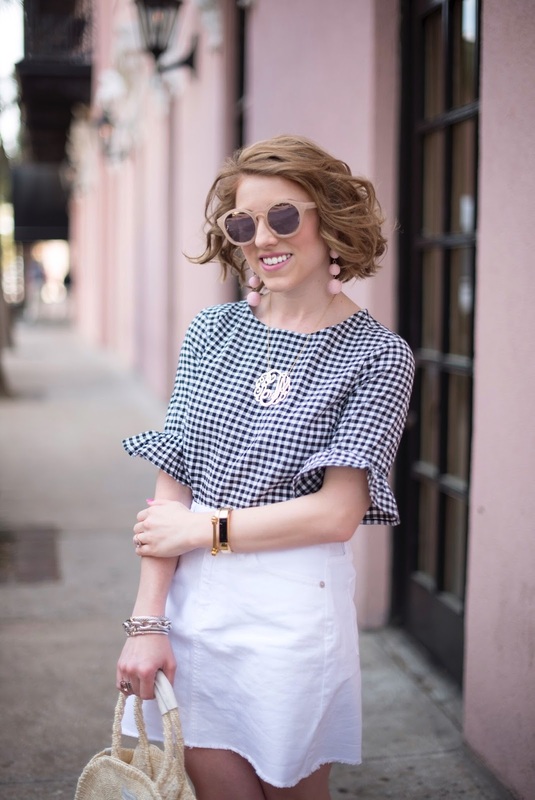 When there is a special detail added, like ruffle sleeves, I fall even more in love with a gingham piece! 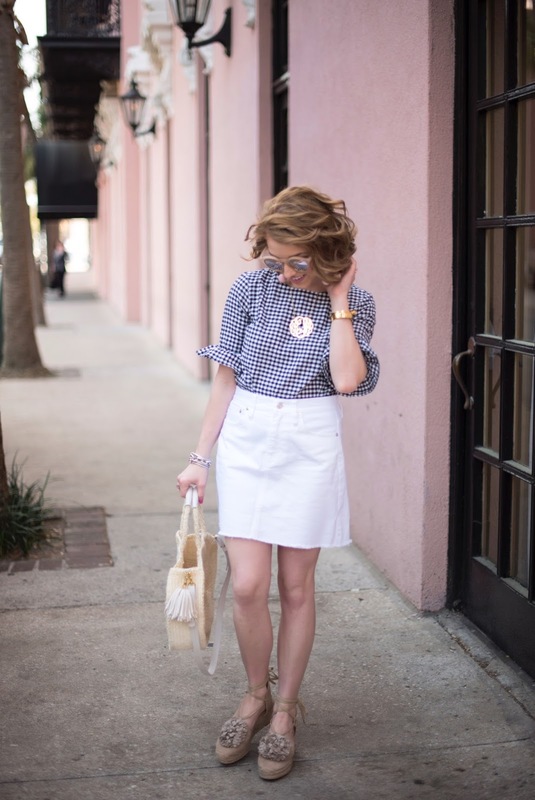 My collection and love for gingham has definitely grown ever since it has become more of a trend. 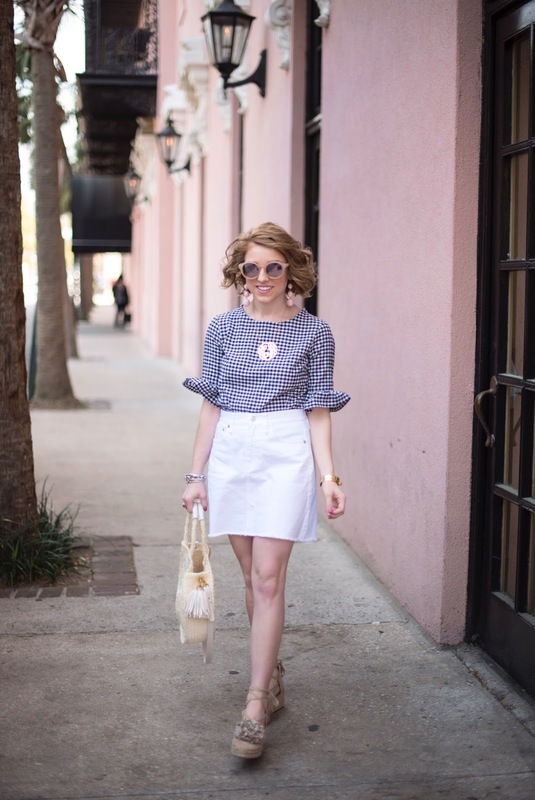 This outfit was perfect for a casual day of walking around Charleston. 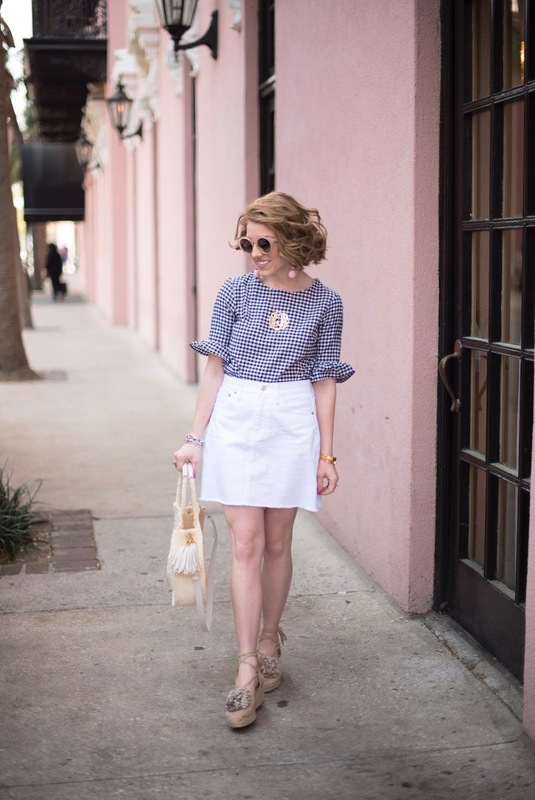 I think that a white denim skirt is also a must-have for the spring and summer. I highly recommend this one! Since I'm 5'2, I decided to go with a 2 petite for little shorter length. I'm so happy that I did. Also, I couldn't get enough of the gorgeous architecture of the Mills House! P.S. If you missed the re-cap of our trip to Charleston and want to see more about our trip, you can find it here! I hope y'all are having a happy Monday so far! It's officially Madeline's birthday week! Although I want to cry about my baby turning two, her excitement has me so excited! I have been talking up her birthday for a few weeks now, and although she may not fully understand what's going on, she is definitely excited! I asked her how old she is going to be yesterday (I'm trying to teach her to hold up two fingers), and she told me that she is going to be turning twenty haha. I partially believe it with the sass this girl has. I also heard her singing happy birthday last night, so I think she knows that there's a fun weekend in store for her :) I still have so much crafting to do for this weekend. I had to set a budget for her party this year (last year got a bit out of hand), so I have been trying to do all of the crafting myself rather than buying it already done. I've got a few things left to do! If you want to see more, be sure to follow along on Snapchat (username: rtimmerman) and my Instagram stories. I'll be posting everything to there as I go along. Thanks fir stopping by, y'all! I think pink accessories are a must have! I purchased these shoes and knew I'd enjoy them. However, I didn't realized just how much wear I'd get out of them! There are so many pieces that look adorable paired with a pop of pink. That's why these pink earrings are perfect for tying it all together.. I also just got this gorgeous necklace that is the exact same color of the shoes, so it is also a perfect accessory for tying all the pops of pink together. I hope y'all set to have a great weekend! It's a super busy one over here. We will be celebrating another one of Madeline's sweet friends this weekend. One of her friends had a birthday last weekend, another this weekend and Madeline is next weekend. It's a fun time of celebrations :) Speaking of, I've got so much crafting to do in preparation of her birthday party next weekend! My days of crafting just for the fun of it are over haha, but I have quite the crafting list to tackle for her party. Happy Thursday! 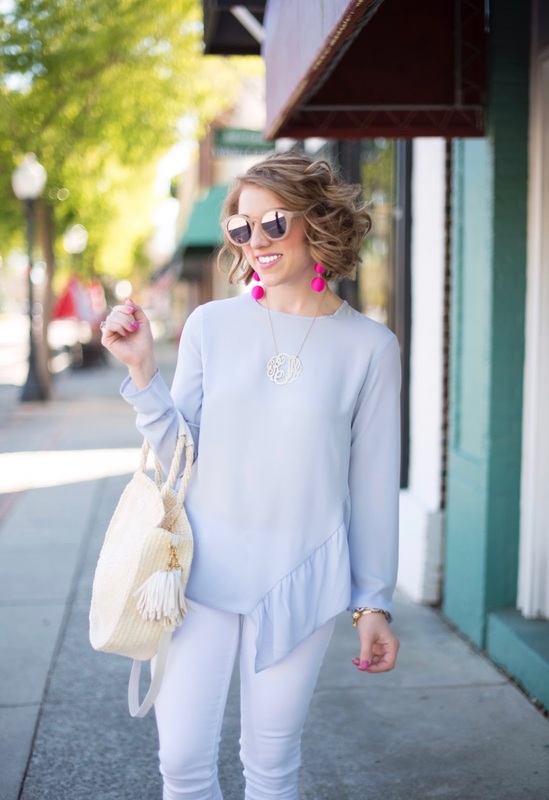 I am so excited to be sharing this post with y'all today! Last year, I fell in love with the bag brand, Jon Hart Design (see the post here). The steamer bag has come along with me on every vacation that I've gone on since the bag came into my life haha. Well today, I'm here to share some other amazing pieces in the GORGEOUS new canvas color, lilac! Isn't is just stunning?! So before I get into some info on the pieces, I want to share my thoughts on the brand with y'all. If you're looking for a new luggage set for yourself, you've come to the right place! If you're hunting for the perfect gift, no matter who you are shopping for, I assure that there a Jon Hart piece for them. From duffles, weekenders, toiletry bags, garment bags, tote bags to even rolling suitcases, the options are endless! 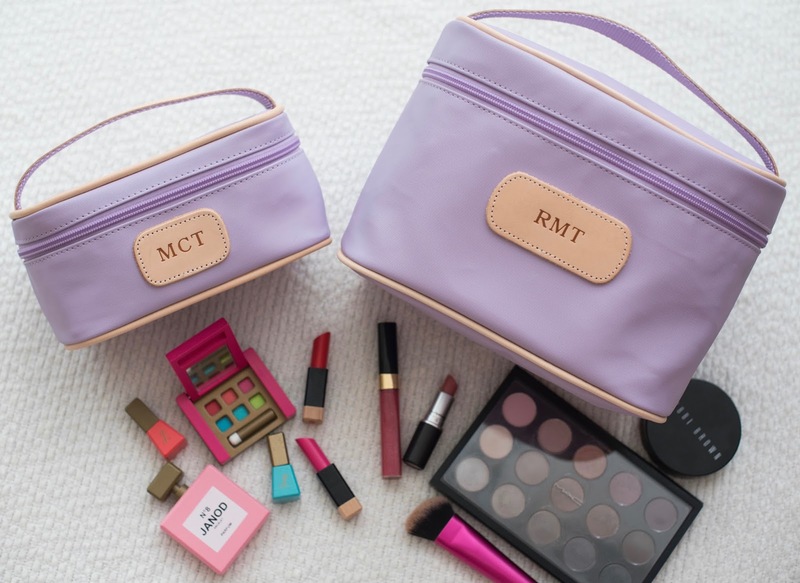 With Mother's Day coming up and Father's Day soon to follow, I assure that a Jon Hart piece would make the perfect gift...hint: Mommy and Me cosmetic cases as pictured above :) Need a trusty graduation gift that the graduate will actually use? Jon Hart will be certain to follow them on all their upcoming adventures. What I absolutely love about these pieces, other than them being incredibly gorgeous and well-structured, is that they are basically non-descructable. Being so durable, these pieces will keep on being that trusty bag you always go to. Like I said above, I have taken Jon Hart with me on every getaway since the bags entered my life. The natural leather trim just becomes a little darker over time, yet maintains its beauty. This also makes Jon Hart perfect for all of the guys in your life (are they not the most difficult to buy for?!). I simply can't say enough positive things about Jon Hart Design. Now, scroll down to see what pieces Madeline and I are currently loving! I'm also going to share a little bit about how we pack for our getaways with these pieces. Here, I am using the Weekender Bag in lilac canvas with natural leather trim and a hot stamp monogram to top it off. It is SO roomy and guaranteed to handle all of your adventures :) I am also using the makeup case to match the weekender. Meanwhile, Madeline is more than thrilled over her mini makeup case, so the she can be just like Mama. How darling is this?! I absolutely love to match with Madeline, but I think she has come to love it even more. Everything that I have, she will immediately want something for her just like it. She will point to mine and say "Mama's" and point to hers and say "Baby's." I am also obsessing over her little back pack, also in lilac canvas. 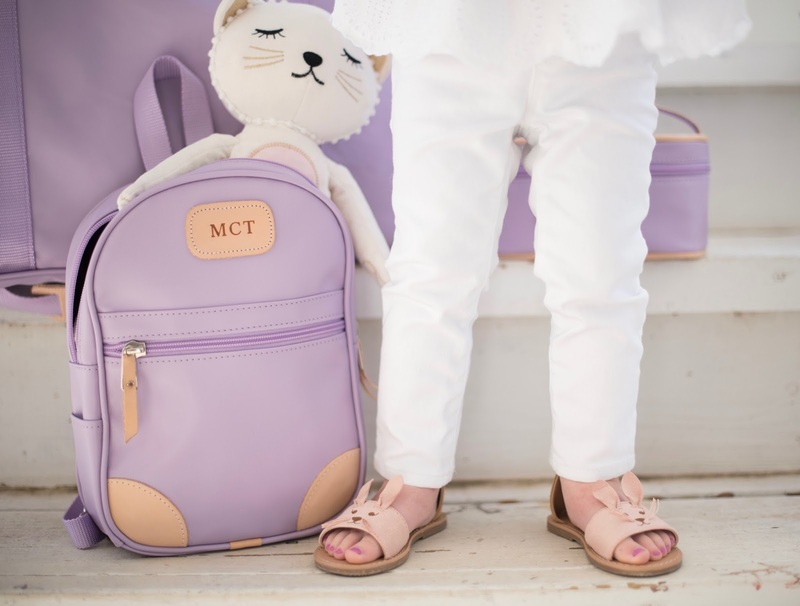 It all depends on where we are going and for how long, but I love that Madeline's little back pack can hold just her favorite kitty cat, toys to keep her occupied during the car ride, and even an outfit or two. P.S. the back packs come in three sizes! But what's even more amazing is that my weekender (and the same with the Steamer Bag I have) is that there is enough room for both me and Madeline! Seriously, these bags are so spacious! I also use my makeup case every single day to store my makeup favorites in. It is perfect for travels as it can hold your makeup, or other toiletries, such as shampoos conditioners and more! The best part is that through the month of March, Jon Hart is giving away a free make up case organizer with the purchase of a makeup case!!! And of course, Madeline's mini makeup case is perfect for her travel size toiletries and her "makeup" as well. She adores her wooden makeup set because you know, she has to be just like Mama. P.S. A HUGE thank you to the spectacular Carriage House Inn in Aiken, SC for allowing us to shoot this post on their gorgeous grounds.